St. Jean-de-Monts St. Jean-de-Monts is rightfully so one of the best loved seaside resorts of the Vendée. Its main attraction is of course the wide sandy beach and you will also find a lively promenade with boat, catamaran, kayak and surf board rental, a casino, many terraces, restaurants and shops. In the port you can catch a boat to Ile d'Yeu just off the coast. On this island you can visit the castle and the museum or hit on one of the many beaches. You can reach Ile de Noirmoutiers (30 km) by car - via a long bridge. This peninsula with its 12th century castle is certainly worth a visit, there is a theme park and a large sea aquarium with seals and you can take a trip with a covered wagon. Back on the mainland you can find large forests surrounding St. Jean-de-Monts where you can walk in the shade of the pine trees. Or would you rather cycle? The many cycleways will take you past long-stretched beaches, through the coastal woods and the hinterland marshlands. Due to the high salinity of the water salt is yielded here; you will see several salt mounds drying in the sun. Plage Merlin in St. Hilaire-de-Riez (15 km) has a water park with giant slides. Fun for kids! Other well-known seaside resorts are St. Gilles Croix-de-Vie (18 km) and Les Sables d'Olonnes (47 km). Attention golf lovers! The first 18-hole golf course is in St. Jean-de-Monts and there are four additional courses nearby! Would you rather relax? Thalasso therapy is also an option. A bakery, bike rental, supermarket, weekly market, post office and a discotheque in St. Jean-de-Monts. Villa park Domaine de Vertmarines Domaine de Vertmarines is on the edge of spacious St. Jean-de-Monts amidst lush woodlands. Both centre and beach are about 3,5 km away. The wide gate gives access to this gorgeous domaine that comprises a very neatly kept area of 6,5 ha with excellent facilities. The reception area has a wireless internet connection and in July/August you will find fresh croissants and baguettes here. Or would you rather indulge by using the breakfast service? The villas of villa park Le Domaine de Vertmarines The park has luxury, detached villas, each with its own private pool. Pleasant for the cooler months: the pool can be heated (a fee applies). The interior is comfortable and pleasant. 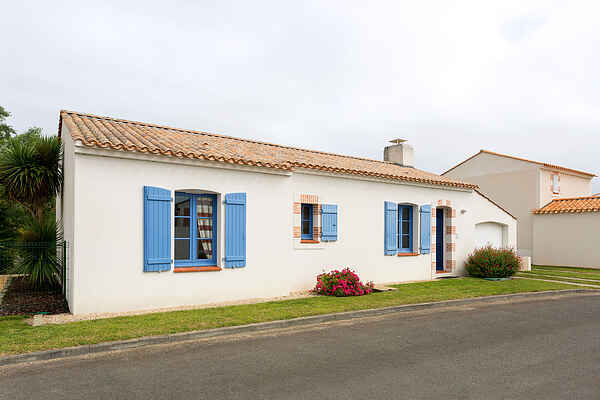 Villapark Le Domaine de Vertmarines - 4 persons Detached, luxury holiday villa (ground floor; 75 m²). Lounge with comfy seating area, dining table and sliding doors to the terrace. Open plan kitchen with dishwasher and fridge / freezer. Bedrooms 1 and 2: each with a double or two single beds. Bathroom with bath or shower. Separate toilet. Washing machine. Garage. In the fenced back garden with garden furniture you will find your private pool (8 x 4 m, deep 0.85 - 1.70 m).